A new load of beautiful, local Whidbey Island rocks, was delivered to the site this past week for creating the edges of the ponds and the stream. Weather permitting, the rock setting will happen Tuesday and Wednesday. Last week all work needed to be terminated due to a deluge of rain. Matthew overlooks the upper pond filled very quickly with roof water from last week's rain. 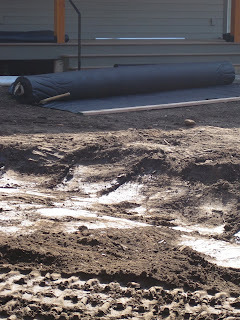 The liners for the creek and lower pond were ready to be installed until too much water stopped all work until the sun returned for some much needed drying out. 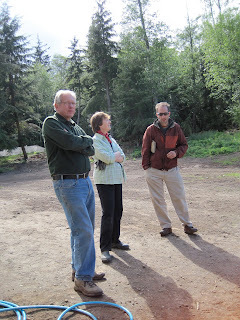 Brad discussing the project with his clients. Looking back at E-L home with the pond and wetland in the foreground. Labor: keeping it affordable, legal and ethical is a challenge with implications far beyond my understanding. But that isn't an excuse to dismiss the issues, only an attempt to evaluate and learn more. It's one of those tricky things. It's tricky from a business standpoint with L&I and taxes; management and job performance; quality of work and supervision; budget constraints; and the ethics of fair wages for local persons versus supporting immigrant workers who also need the money. It had been my intent, in order to keep labor costs within budget, to hire some of the hard working young men from Guatemala who I see patiently waiting every morning to be picked up as day laborers. My crew would oversee their efforts. My clients would hire and pay them. However, this past few weeks they haven't been there waiting for work. So I was pleasantly surprised when I met Christine. She's attending green workshops and sustainable design charettes within her community, concerned about the health of our land, exploring alternative living models. She travels without a vehicle. She came out to the project for a couple of days to help clean up the land and was loving it! As it turned out, the rain last week put a damper on the project and I had to postpone heavy work and move the machinery and crew to another job. She stayed though and worked diligently for three full days nearly eradicating the Canadian thistles on 5 acres of land. She gathered more rocks than all the other helpers combined (Joe disclosed) , turned a fairly rough road into a marvelous little trail, and was willing to work for modest wages to be doing sustainable work. Plus, she was focused, worked hard and worked without supervision. Cristine wondering which patch of thistles to go after next! *Canadian thistles can penetrate even the best gloves. I just love this little vignette right outside of FrEdLey's front door. What I really like is the timelessness or lack of age. It's hard to tell how long these objects have been around but the reality is, this is going on the second year for all. The architecture and garden and Art didn't exist 2 years ago. It seems this is a fine place to dig a well. Interesting how much water is on the E/L site. First, we hired Greenbelt Consulting. Elliott, a blackbelt in land management issues, was able to identify the existing problems regarding the land. Second, we dug a test hold. Digging the hole in the earth took the guess work out of what we would find when we progressed on to digging the pond. We knew the land was saturated from previous observation but it was surprising to see just how quickly the hole filled up with water even though it hadn't rained in several days. At about 30" we found what we were looking for. A layer of sand and gravel about 3/8" thick with no fines. They either were washed out with the migration of water or weren't present during deposition. There is clearly a thin flat creek running under the entire site. The next day, the hole is full of water, right up to the liquified layer. The problem here is cancerous as the newly released water, once contained in it's own layer, is now exposed to more soil with a larger surface area. 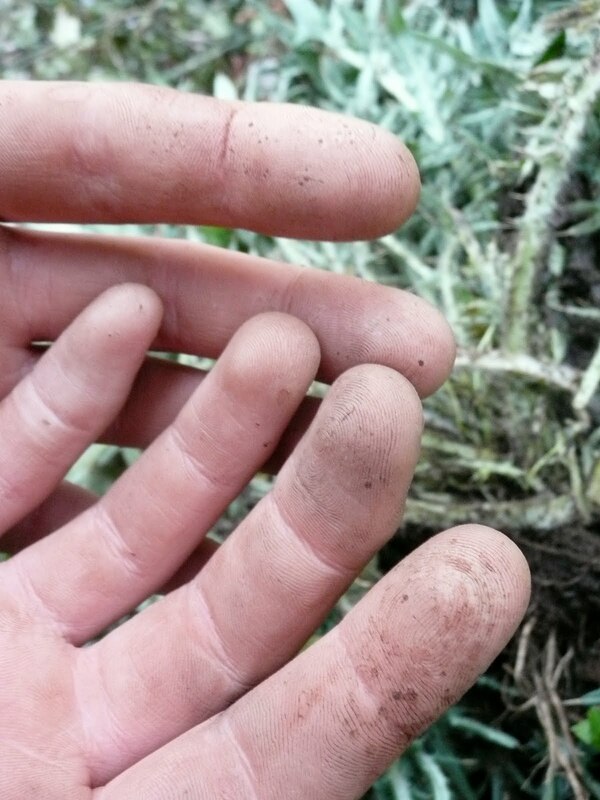 This soil begins to saturate and sluff off until soil over 3' away is soft and muddy. Knowing we were there for restoration and not a Monster Truck Mud Bog Flaming Tractor Rally, we opted to keep the hole and water contained and undisturbed until we were ready to dig the pond. Interesting foot note: We did have an orange tractor and a 4-wheel drive truck on site. Above-two happy hardworking clients leveling low spots in the temperary law (holding planting before trees and shrubs) near the driveway with organic material from the property. Above-final raking of 'intuitive depression'-our solution for water control by garage. Below-some of the smaller rocks that will trim the stream and ponds. Above-scraping the top soil where we need to excavate. Below-A test hole in the pond. Indeed the ground is saturated with a liquefied layer about 30" below the ground. Within minutes it began puddling and the side of the hole began collapsing less than an hour later. Above-Josh, documenting our process on video and well camouflaged, sets up his time lapse shot. 2 Below-Travis and josh horsing around. -The small upper pond excavated. -Rock awaits placement of liner for upper pond while Joe and Josh stretch the giant inter tube made by Firestone over the underlayment in the hole. At Cheryl's, the fence was near a steep bank of sluffing fill that needed to be protected anyhow. Native plants, vital to the control of erosion were loosing to the hungry herd of Ruminantcervidea (cud chewing deer). And, she wants to have a vegetable garden! So we designed and built this fence. Even on a deer fence, design is important. Where will it go, how long is it, how much pruning and damage to the land during installation, effectiveness, longevity and pricing of materials all happen during this time. This is the only way to make informed decisions about an addition to any house or land and is so often skipped for economy. The reality here is the client spent what any one would spend for materials and a weeks hard labor but got the best materials and the best price locally and a fence built solid enough to not have to be repaired in 10 years. It even looks great! I love this little dear fence. It is architectural and organic. It defines space without separation. It follows the contours and obstacles but simply and smartly. And most importantly, it keeps the deer out. Many people will tell you a 5- fence is fine. Others will tell stories of deer jumping 8 1/2'. The reality is both are right. Like any good designer will tell you, there isn't one right answer. Intuition, observation, experience and knowledge will result in a different answer every time. On the lower portion of Cheryl's property is a ravine. It very much wants to be restored to the stream that used to be there, with a pond and overflow wetland. Currently it is home to a thicket of salmon berries, wild roses and trees such as this willow. It has a wild feel that has been tamed with the installation of the fence. The point being that this thicket is useful for keeping deer out. They can't get through the brambles any better than we could and even so, they have no room for jumping. So a 5- fence will work great in these areas. Up above on the open level, the fence is 7.5' tall. 2-Just having a clear sight, an implied boundary and passage through has turned the unusable space into a tempting path into the bushes. 3-A full wrap on the fence points the end of the wires away, reducing snags. 4- A close up of a solution for Cheryl's roof water, but certainly not the answer. This water will go into Cheryl's pond next year. The large rocks were delivered for the ponds and stream and the small rocks have been collected from the site. 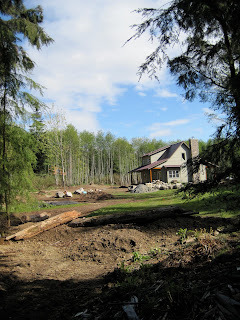 In the background you can see the pond and wetland in-the-making. 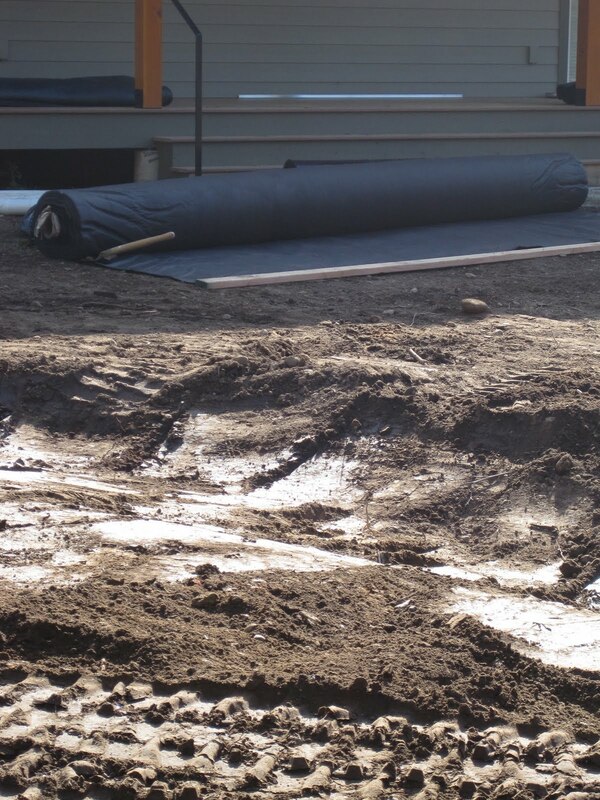 Pond liners, with custom delivery by Barry (Brads dad), are now on site. This small pond is ready for the liner with a shelf for rocks and plants around the edge. Simple materials, attention to detail and respect for the land. If architecture and plants could speak, this is what they would say. This plant had been relocated from an area to be disturbed to a little nursery started by the clients where it overlooks the preparation of it's new home. These plants were all relocated from areas that needed grading. They are the natives we save--At the same time, we also dig out any Canadian Thistle or other noxious weeds to not contaminate our top soil we want to re-use. Above-A different perspective of Eckert/Lyon. 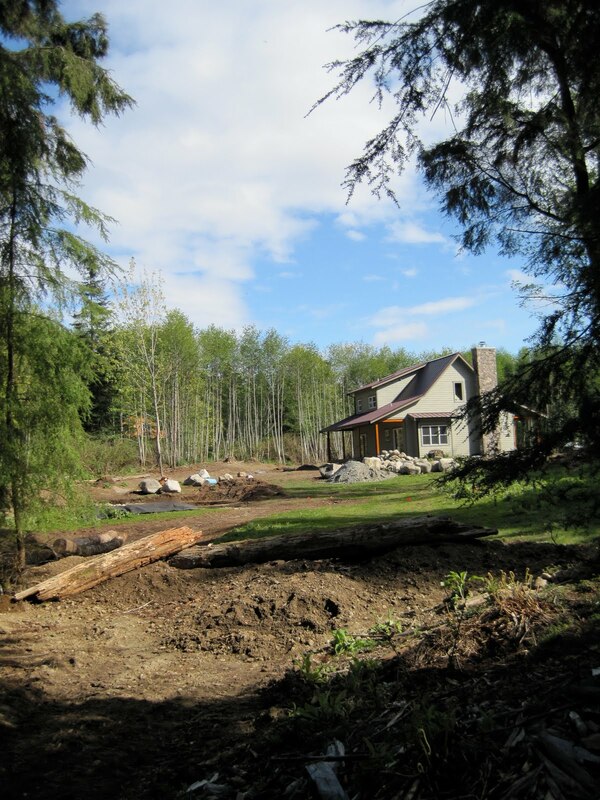 Some photographs of the Eckert Lyon project before we started grading the land and installing the ponds, stream and wetland. Two very hard working clients enjoying manual labor on their land. They cut and split all the wood in the picture, including the stacked and split material, in a half day! Their wood shed is so full it can no longer hold the splitting maul! The condition of the land is a bit rough but with so much potential. It's exciting to think we're taking water, a current liability, and turning into a beautiful asset. Groundwater replenishment, zero erosion, dry driveway and walk, habitat for animals, swimming, water catchment and retention to mitigate flooding to also be used for irrigation or even drinking, an ice skating rink in the winter and an irrigated field to be played on in the summer! This ponding is mostly the result of rough grading and some very complex water issues. The area of collection is small but we have speculated that the below grade drainage basin for the gutters (right next to the septic tank) is dumping water onto earth that is already saturated with water. With no where for the water to go, it seeps to the low spot, here above drive way. The ideal solution is a drain which would have to go under the drive way. 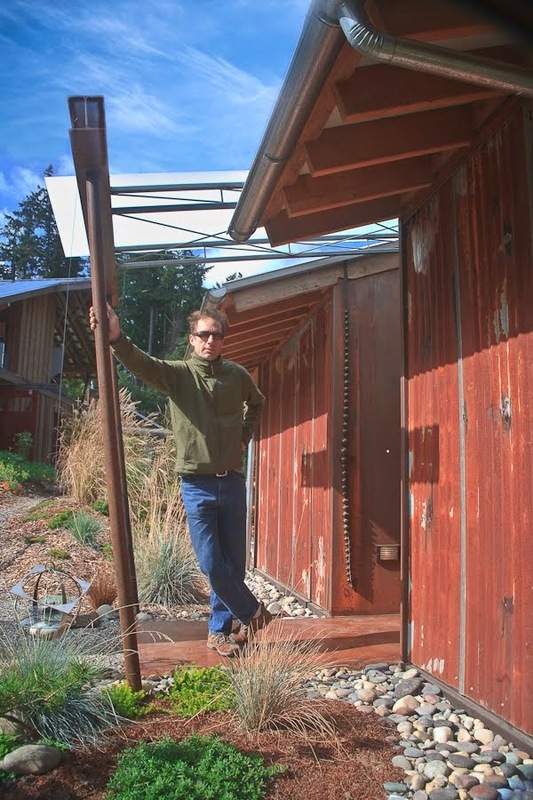 After two years of mud, and construction, the clients can finally walk to their front door. The drain would entail ripping out way too much drive way. The dbBrad solution, though counter intuitive, got the approval of Greenbelt Consulting and Fran Abel Landscape Consulting. We are going to create a depression away from the road to handle the water and use the material we excavate to build up this low spot. If water seeps through and continues to soften the driveway, it will eventually need to be fixed and we put the drain in then. Josh models the instep of a large dozer, probably 40,000-60,000 lb machine. Even after a year the forest floor shows the compaction, here over 15". It is only in the past few years that the full impact of machines on the land is being understood, leading to use of machines that are smaller, weigh less and have rubber tracks. We also know now that working on wet land causes more damage than working on dry land. Unfortunately, sometimes the project has a life of its own and NW weather is unpredictable leading to the breaking of using machines only on dry ground. With the help of people like Elliott Menashe of Greenbelt Consulting less and less damage is being done to land as he helps all of his clients understand the ramifications. This area of water travel, coming from the garage area, was eroding the land and we were concerned that it would become an even bigger issue in the future. Because the driveway had flooded multiple times (separate issue from paragraph above), a drain was put in the center of the driveway loop and brought to grade over 100' away (roughly half way between photographer and truck). We developed a swale to handle the water from both the site and from the drain to direct the water to the wetland. Fran, always looking at home with a shovel and a plant, walks on what will be the inlet side of the pond. This entire area appears to be lower than the surrounding forest floor indicating previous soil removal and heavy equipment staging. This outflow was a special feature completed after home construction completion. In an emergency flood of water coming down the utility ditch, a French drain was installed (behind wood shed) and run to grade again over 100' away and into this gully. This water will be picked up in the new stream which will be lined and planted to turn this standard water solution into an aesthetic feature. 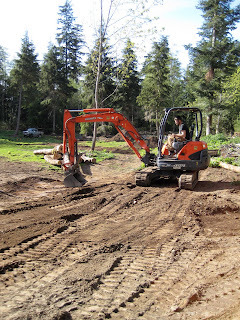 The Excavator works it's way for the first time delicately across the forest floor. It's moving to the east of the house (where the wood pile was located). to grade that area. Joe spent the better part of a day digging native plants where we will be re-grading for pond and wetland. Here are some photos of him with his favorite clump for the day. I'm not sure why I took 4 pictures other than enjoying the composition of Joe displaying his salvaged native grasses, but I'm glad I did. It makes me giggle to think 4 pictures of joe holding delicate native grasses could be so entertaining. Perhaps Joe should have been an actor, but I'm glad he's with dbBrad. Joe being 'attentive' to the grass. Joe getting 'emotional with the grass. Joe showing off his finger of reduced mass. Joe being 'stern' with the grass. Travis after week one of Internship is a little overwhelmed. We have generated some interesting discussions on the ethics of interning as we look at the values and costs of interning from the perspective of interns and companies. As much as I enjoy teaching, if the costs of having an Intern are not recoverable as billable work of some sort, the incentive of increased paper work and teaching time is less appealing. Thinking Travis was getting soft in the office, we sent him over to Lois's project for half a day to get some fresh air. Above, Travis in the office trying to make sense of Brad's requests! Below, Travis and Joe, long time friends, demonstrate their affections with garden rakes!